The history of the Austro-Hungarian Dual Monarchy's first and only Dreadnought battleships are a rather interesting and intriguing one! Two shipyards were invited to make design studies based on these requirements: Ganz-Danubius (Ganz és Társa-Danubius Villamossági-, Gép-, Waggon- és Hajógyár Rt. - Ganz and Partner-Danubius Electrical- Machine-, Wagon- and Shipbuilding Co.), Fiume/Budapest and STT (Stabilimento Tecnico Triestone), Trieste. Ganz-Danubius refused the invitation as it could not build such large warships and this led the automatic acceptance by STT where the Naval Engineer, Siegfried Popper was working in cooperation. Siegfried Popper was recently retired from the post of the Naval Engineering Office, according to many the whole application was intended exactly for him to get the job of designing the new battleships, this was supported by the fact that the ships construction began well before the entire design contest expired in 1910.
and the third group was the 10x main gun armed versions (5 ships). On April 16, STT was interested in receiving plans. Although the plans included mainly 30,5cm L/50 calibre cannons, the 30,5cm L/45 calibre ones were too included. Skoda, who produced the cannons, had problems with the development of a longer calibre cannon, so the shipyard of Trieste redesigned the plans of the VI and VII Projects with L/45 calibre main guns. On April 20, MTK asked STT to produce another 12 gun in 6 turrets armed design which was completed on the 27th in 2 versions. 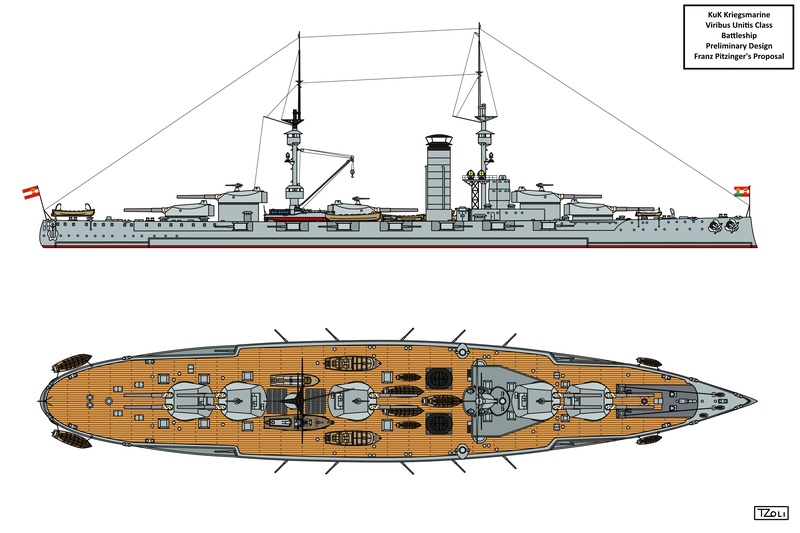 Shortly thereafter, on May 5th, at Montecuccoli's personal request, STT Trieste prepared another 12 gun L/45 calibre main gun armed design in 4 triple turrets which became Project VIII and which was used as a basis for the final version. This last project was the first to use triple turrets, with the idea was likely to emerge in designers' minds in January that year, as it turned out that the Italians wanted to equip their new battleships (Dante Alighieri) with such turrets. In the spring of 1909, the Navy was allowed to check the plans of the newest German battleships then under construction (Kaiser class). With this task, the secretary of Montecuccoli, Frigate Captain Alfred von Koudelka, was sent to Berlin on the evening of 29th April. Koudelka was personally greeted by none other then Grand Admiral Alfred Peter Friedrich von Tirpitz, who with surprising openness even presented with German plans and commented on the Austrian plans taken by Koudelka. Tirpitz objected in particular to the thin belt armour and insufficient torpedo protection on the Austrian plans. The British were also strongly interested in the Austro-Hungarian dreadnought plans, as Koudelka was followed by an English spy at the time of his stay in Berlin. At the beginning of the conversation, Koudelka, appearing on the 29th in his uniform, Tirpitz called him to the window and showed him the spy on the other side, then asked him to come in civilian the next day. (Those nasty British spies! :D ) Koudelka returned home with a detailed and extensive information of the meeting which, however, was partly accepted due to the secrecy involved and such the designers knew little about it. 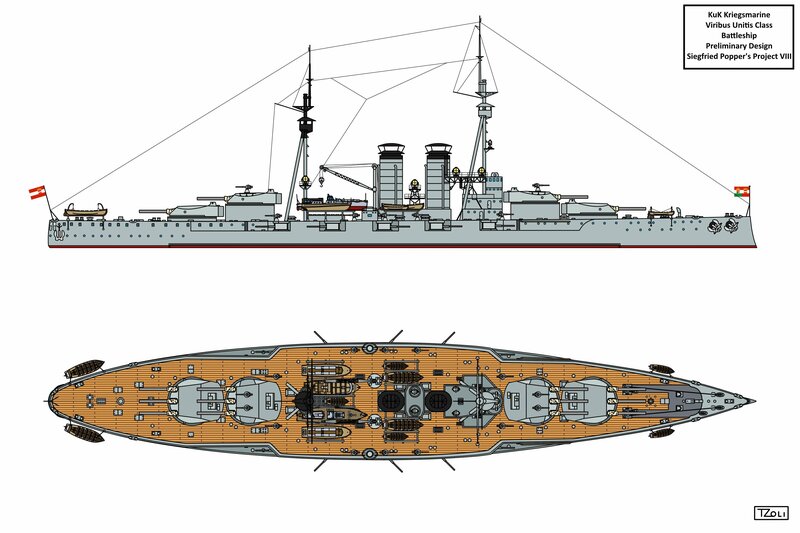 The Belt armour was indeed thickened with some calculations even showing 290 and 300mm Belt but in the end it was finalised with 280mm due to the capacity of the Austro-Hungarian shipyards (displacement directly effects ship size). On June 9, 1909, the final design contest was issued under the amended terms. The proposed displacement was increased to 20.500 tons, main guns were of 30,5cm L/45 calibre ones (The the 50 calibre ones had construction errors and thus not chosen) the secondary and tertiary guns were chosen of 15 and 7cm (66mm) ones with the increased armour belt of 280mm. For propulsion steam turbines were chosen with auxiliary oil fired boilers next to the coal ones. Popper had submitted six more proposals a few weeks later (varying in tripod or polemast arrangements) and of these, the design "F" was finally selected. In addition to Popper, two engineers, Franz Pitzinger and Theodor Novotny, presented their own drawings in the spring of 1910 when the original deadline expired. At this point, however, the detailed design of the Popper Plans was completed, and in November of last year, the contract was signed with STT for the construction of two ships. The designs of Pitzinger and Novotny were shoved to the depths of the archives, but they received cash compensation for their work. Montecuccoli dictated a forced pace for the designers, as the start of construction was planned for the spring of 1910. The cause was the peaceful rivalry between the KuK Kriegsmarine and the Regia Marina as the Austro-Hungarians wanted to build their battleships first and hence the construction was finally begun in the summer of 1910 even when the entire design documentation of the ships had not even been completed!